The TT-4C tone transmitter is designed to transmit four Form A or Form C (K, Y, and Z) energy pulses from a metering location to an SSI Model TR-4C remote tone receiver over a twisted wire pair or a leased telephone line using DTMF (touch tone) technology. Distances of up to 1/2 mile are possible over a twisted wire pair without further amplification, under good conditions. The TT-4C tone transmitter will work with either a dedicated private leased telephone line or through a single or multiple central office exchanges. The distance available over the telephone lines is unlimited for all practical purposes. Other suitable audio transmission mediums with a bandpass of 500 to 2000 Hz such as microwave and powerline carrier systems will work satisfactorily as long as audio frequencies are not degraded. The TT-4C’s transmitters tone generator is quartz crystal controlled and does not require frequency adjustments. The TT-4C can transmit communications lines to multiple TR-4C tone receivers for distributed demand control over a wide geographic area. Any data transmitted by the TT-4C will appear at the output of all receivers simultaneously. The tone output is through a 600 ohm transformer which meets the FCC Section 68 telephone equipment requirements. A ten-turn potentiometer allows easy tone output setting of between -30dbm and +3dbm into a 600 ohm load. Bright red and green LEDs monitor the input status to the TT-4C and provide easy & immediate visual system checking without additional test equipment. An incorrect sequence of input pulses will not be recognized and only the first valid pulse of the sequence will be transmitted. The input and output terminal strips are EURO-style for superior isolation. While the TT-4C is primarily designed for the transmission of metering and demand interval pulses, it is capable of transmitting any desired set of four Form A or Form C contact closures such as breaker, transformer etc, status to a TR-4C receiver. Output: Tone between 600 and 1700 Hz at a level of -30dbm to +3 dbm into a 600 ohm load. 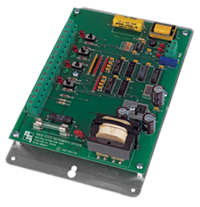 The output transformer has a line impedance of 600 ohms and is suitable for connection to a normal leased telephone line. The TT-4C/TR-4C system does not use dial tone. Note: Some telephone operating companies may require installation of a neutralizing transformer which operating in a substation environment or other locations capable of having high fault currents.